Also available from iUniverse: A quality paperback with Emily Arnold McCully's original illustrations. 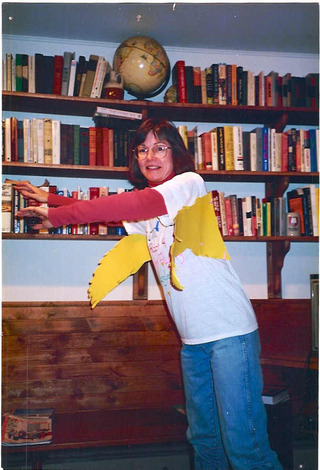 Fourth graders in Vacaville, California made these wings for me. Would you believe they really work? My first book, now an e-book! "Fly with your own wings!" said the ad on the back of Andrea's comic book. Even though she knew people couldn't really fly, Andrea decided to take a chance. Andrea knelt on the floor of her bedroom, reorganizing her comic books. She loved her room, the only bedroom on the third floor of the house. It was built out of part of the attic, with an east-facing dormer window. This room had two great advantages. First, it was up so high that Andrea could see far out over the town--over trees and neighbors' roofs to her friend Lauren's house, or to the school six blocks away. On sunny days like today, she could even glimpse the shining pond in the bird sanctuary. The second advantage was peace and quiet. Andrea needed peace and quiet for projects like making her own paper dolls, or studying her bird nest collection, or reorganizing her comic books. Until today she had kept the comics in series: a pile of Bugs Bunny, a pile of Dennis the Menace, and so on. But this afternoon she had a better idea: she would sort them according to how well she liked them. Then she would have only three big piles, which would fit better in her bookcase. Three piles seemed right. A Favorite pile, a Pretty Good pile, and an Okay pile. She didn't have any comic books that she thought of as Not Very Good or Terrible. That wasn't exactly true. Andrea picked up the end of one dark brown ponytail and sucked it nervously. She did have one Terrible comic book. She had just thrown it into her wastebasket. Now, for some reason, she wasn't sure she wanted to throw it away. That was silly. Andrea went to her desk and wrote out three labels: Favorite, Pretty Good, and Okay. She set three three piles of comic books on a shelf of the bookcase and taped the labels onto the edge of the shelf. As she pressed down the last label, the bookcase wobbled and one of the paper dolls on top pitched headfirst into the robin's nest. Andrea sighed and set the girl doll back on its feet. She was pleased with these paper dolls, which she had drawn and cut out of cardboard and made clothes for herself, but it was very hard to get them to stand up right. The extra piece of cardboard propping them from behind didn't quite do the trick. The robin's nest seemed to be coming apart, too. Andrea replaced a stick that had fallen out, setting it in with a glob of paste for good measure. The paper dolls were a family like hers, a mother and a father and a daughter. Except that her own family also had her big brother Jim. "Why doesn't the girl have a big brother?" Lauren had asked last weekend. "Or a little brother, like mine?" Andrea had shrugged. "She doesn't really need a brother." The story in the Terrible comic book was about a family. She couldn't help thinking about it. Unwillingly, Andrea pulled the comic out of the used tissues and pencil shavings in her wastebasket and looked at it again. Chilling Tales, it said on the cover. The letters were green and purple and sort of dripping. The worst story, "No Longer Human," was about a boy who changed into a huge beetle. It wasn't his fault--he just woke up one morning and discovered he was now a beetle. He tried to ask his father and mother and sister for help, but he could only make beetle noises. And they hated him. They didn't want to believe that this disgusting insect was really their son and brother. They locked him in his bedroom and kept him there. He got more and more frantic, until finally he tried to break out one morning when they brought him food. That frightened his father so much that he threw a lamp at the beetle, breaking his shell. After that the boy-beetle stayed quietly in his room. The wound in his shell became badly infected, and he grew sicker and sicker until he died. Then his mother told the trash collector to haul his body to the dump. If only she hadn't bought this comic book and read this story. How horrible not to be yourself! How unthinkably horrible to see your own family turn away from you in fear and disgust! Andrea tried not to think about it, but the story seemed to crouch in the back of her mind, waiting to be remembered. Every time she thought of it she wanted to shout, "No! It didn't happen!" Of course it hadn't happened, but somehow it seemed as real to Andrea as anything that had. Maybe she wouldn't throw that comic away yet, but she wasn't going to keep it on her bookshelf, either. She was about to hurl it onto the top shelf of her closet when she noticed a picture on the back cover. This picture wasn't horrible at all. It showed a girl with red and blue and yellow wings swooping over the treetops, laughing. On a nearby branch a robin was watching her with its beak open, almost falling off its perch in amazement. Do not send cash thru mail." Andrea studied the picture for a moment. Then she stepped over a half-finished jigsaw puzzle on her floor to look out the window. For just an instant she imagined herself floating on the warm September wind, high above the front lawn and the lilac hedge, over Maple Avenue, over the television aerial on the house across the street. It was a wonderful, free, powerful feeling. Then she laughed quickly, as if someone had caught her having such a childish thought. She knew people couldn't fly. Any four-year-old knew that. Still . . . no one needed to find out that she sent away for the wings. She had her own money. How much was the kit? "A stupendous value at only $5.98!" She had a lot more money than that. Her grandmother in Florida had sent her ten dollars for her birthday and she hadn't had a chance to spend it yet. Of course Andrea knew that advertisements didn't always tell the exact truth about things. She had been gypped before. The worst disappointment had been the time she sent in her $1.89 for a Treasure Chest of Magic. "Astound your friends!" the advertisement had said. "Dozens of mystifying illustions!" The picture had shown a golden jewel-encrusted chest with cards and rabbits and Aladdin's lamps spilling out of it. But when the package came and Andrea tore it open, the treasure chest inside was very small and made of cheap plastic, and all the props for magic tricks looked about as convincing as the prizes in cereal packages. Andrea didn't bother trying to astound her friends with that junk. She didn't like being laughed at. Feeling sorry for her, Dad had taught her how to pull a quarter out of someone's ear. That partly made up for being cheated, but not completely. Andrea examined the Wonda-Wings advertisement more closely. "Absolute money-back gurantee if not completely satisfied," it said. What could she lose? Yes! I want to fly! My check [ ] money order [ ] for $5.98 is enclosed. Here Andrea stopped. She didn't have a checkbook, but Mother did. Andrea could give Mother the money, and Mother could write the check. That's what they'd done when she sent away for the Treasure Chest of Magic. Except that Mother wouldn't do it this time--Andrea was pretty sure she wouldn't. "I can't let you waste your money like that, Andy," she would say. "Didn't you learn anything from the Treasure Chest episode?" Dad would be even harder to persuade than Mother. That left Jim, who was sixteen. Andrea didn't think he had a checking account, but he would probably know how to get a money order. Would he make fun of her? He might. When he noticed her at all he treated her as if she were a silly puppy or something. On the other hand, she didn't think he would care whether she wasted her money or not. It was worth a try. Andrea cut the form out of the comic book, pushed back her chair, and tossed Chilling Tales onto the top shelf of her closet. Then she hurried to the window. Pushing up the screen, she leaned out the window so she could see the driveway. There was Jim, shooting baskets. Andrea pattered down the two flights of stairs and ran out the kitchen door to the driveway. Jim was hooking a shot at the basket. "Hey, Jim," she yelled, and he missed. Frowning, he caught the ball as it slid off the garage. "What d'you want, shrimp?" "Well, I was just wondering if you would help me get a money order." Jim didn't answer--he just stood there, one hand in his pocket and the other bouncing the basketball at his side. "I need it to send away for something." Jim shrugged. "Give the money to Mother. She'll write a check for you." He turned away, rose on the balls of his feet, and shoved the basketball into the air in one neat motion so that it dropped cleanly through the basket. "Nice, Reve, nice." "No, she won't." Andrea stepped in front of him to make him pay attention. "She'd say it was a waste of money." "Oh, good. So you want me to drive you to the post office to get the money order so Mother can get ticked at me for helping you waste your money." He looked at her with one eyebrow raised. "What're you sending away for, anyway? A nuclear weapon kit? Let's see." He reached out for the form in her hand. Andrea stepped back, holding the form behind her. "Why can't you just--" She stopped. "The post office? That's where you get money orders?" "Yeah, didn't you know that?" Jim looked at her sharply, then twirled the basketball up into the air and caught it, smiling to himself. "Well, Mother, I just blew it. Sorry. Sport, you're smarter than I thought." He dribbled the basketball down the driveway. Andrea ran back into the house and all the way up to her room, skipping every other stair. Hooray! She could send for the wings by herself. She took the cork from her pig bank and coaxed out the ten-dollar bill with a pencil, stuffed the money into her shorts pocket, and dashed back downstairs. Grabbing an envelope and stamp from Mother's desk, she ran out to the garage to get her bike. As she wheeled it down the driveway Jim called, "Way to go, squirt! Waste that money!"